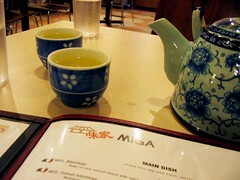 A korean-japanese restaurant opened up near my place recently, called "Miga", its on bank and waverley. What can i say, i'm thrilled!!! Had dinner there last friday. With massive expectations we went in, and with great thirst i found out their liquor license is still pending. I fretted not, got some water and their brown rice tea, it was kickass. Their menu is a lot like the only other korean place i've been to in town, that bbq place on rideau, but perhaps not as big. They've got traditionalish korean dishes, japanese noodle dishes, and all the regular sushi stuff (nigiri, rolls, etc..). Their main korean dishes come with miso soup and korean salads, ie sesame greens, kimchi, and what seemed like incredibly canadian potato salad. The kimchi might've been from a jar, but it still rocked (if bad kimchi exists, i've never tried it). The miso soup was well, just warm and kinda tasteless... but it was the only low point of the meal, and i still gulped it all back. We also ordered a spicy tuna roll for an app which was kickass, but again, how can you go wrong?? 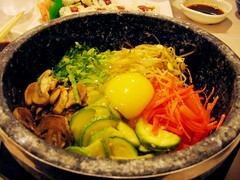 So we both ordered main dishes with all the fixins i mentioned above, I ordered the dolsot bibimbap pictured here. It arrived pretty much first, ie with the apps, which they apologized for, but because of the uncooked egg and the rockin hot stone bowl in which it can be cooked by the consumer, they probably didn't want to wait. It says on the menu its veggie, but it normally comes with beef, which was confusing, but i got them to omit the beef anyways. It was kickass. I liked cooking my own eggs, and with all the veggies and some funky red spicy sauce it rocked my world. But again, if you haven't learned by now, i'm kinda easy to please with food. After it all they gave us this iced dea that was douced with cinammon to refresh us, and holy crap did it ever. The next time i go (possibly for take out) i'll try some of the japanese noodles. And yes, i will be back. It was reasonably priced (8-13 i think for a dish) and mostly filling, although for me i'd need an app and a dish to be fully satisfied. We were quite stuffed, but still went for gelato after, which didn't jive too well, but meh, it tasted good. Read the one review here if you like. These people are a lot harder to please than myself. Its true, the portions might be improvable, i'll have to go check soeul house for sure, just to get a better frame of reference.